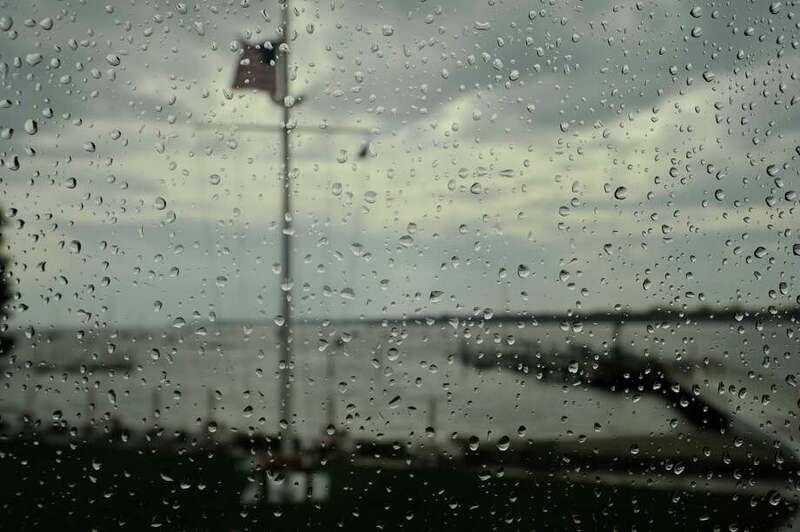 Raindrops cling to the window of the Stamford Yacht Club on Tuesday, June 11, 2013. There has been record-setting rain so far this year in Stamford, Conn. This first day of the work week, which wraps around Independence Day at its midpoint, promises to be sunny and hot in southwestern Connecticut. The daytime high temperature will rise to the mid-80s, according to the National Weather Service, with a northwest wind between 5 and 13 mph. Tonight will be mostly clear as the temperature dips to the mid-60s. There will be a northwest wind between 3 and 6 mph. Tomorrow also will be sunny with temperatures in the upper-80s. There is a slight chance of showers and thunderstorms overnight as skies turn cloudy and the temperature registers a low in the mid-60s. The Fourth of July outlook is a 50/50 chance of showers and thunderstorms, the NWS predicts. It will be mostly cloudy and daytime temperatures will rise to the upper-80s. There is also a chance of showers and thunderstorms Wednesday night with a low temperature in the low-70s. When the second part of the work week resumes Thursday, the weather service says skies will be mostly sunny and temperatures will be in the mid-80s.